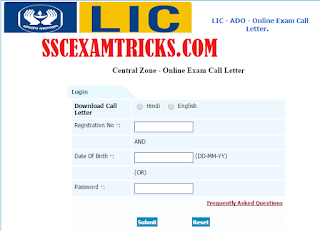 Check LIC ADO Admit Card 2015 - Download LIC India ADO Call Letter 2015 - Download LIC ADO Hall Ticket 2015- Latest News of LIC ADO Admit Card: LIC India has announced online written test on 19th July 2015 & 25th July 2015 for the recruitment of Apprentice Development officer (ADO) 2015-16. LIC has released your online Admit card on 14th July 2015 for LIC India ADO Written Test 2015 on official website www.licindia.in. You can download your Admit card for all seven zones. Central zone, East Central Zone, East Zone, North Zone, South Central Zone, South Zone and Western Zone. Approximately 10 Lakhs candidates are waiting for online release of admit card for ADO in LIC India. The direct link is given below for your easiness to download admit card for LIC India ADO Written Test 2015. You can download LIC Admit Card for online examination held for recruitment of 5066 Apprentice Development Officer (ADO). Click on the zone where had applied through online application during registration. The LIC admit card page will be displayed on the screen asking for information which you had given after successful your registration of online application. You shall enter your registration ID same as it was given to you after registration. Then enter your date of birth as DD/ MM/ YYYY in the column given below registration ID. Enter the captcha code or string displayed at the bottom of the page. 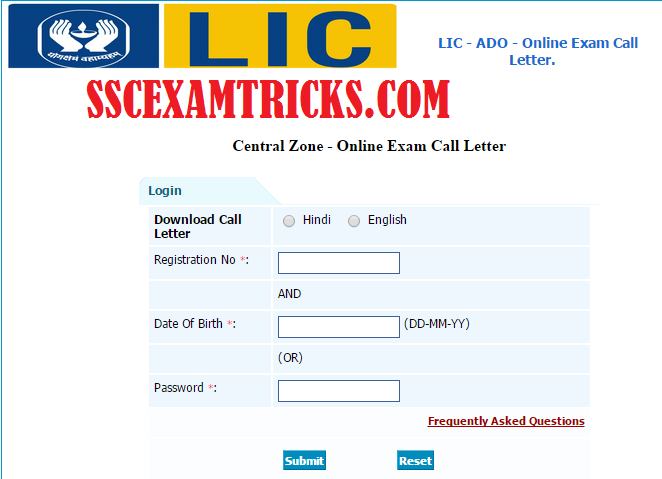 Click on the submit button to download LIC Admit Card 2015 for online examination for ADO posts. You can now take printout (hard copy) of LIC admit card for ADO Examination 2015. Note down the date, time and venue of LIC Online Examination which will be mentioned in LIC ADO Call letter 2015. You should remember that you need to produce the printout of your LIC Admit card 2015 to get entry in to LIC Online Examination 2015 held in July 2015. Now affix recent coloured passport size photograph on LIC Hall Ticket and do your initials or signature in the box given below the coloured photographer on the LIC admit card 2015. It suggested that you should bring one identical recent coloured photograph (same as it is printed on the LIC admit card) to the venue of examination. You must remember that LIC admit card will not be valid without photo identity proof which need to produce at the time of getting entry to the examination hall for LIC written test. Proof Identity proof such as Voter Identity Card or Passport or Driving License will be valid with LIC admit card to attempt online examination. You should note that LIC will not send any admit card by post/ courier to the eligible candidates for LIC Examination 2015. You will have to download LIC Admit Card from the official website or direct link given above. In case any of you having problem regarding downloading LIC admit card or admit card not found / uploaded etc. then you can inform officials on LIC email id mentioned at contact us menu on the official website. LIC ADO Exam Pattern: The LIC ADO Examination 2015 will be conducted online mode or computer based examination. All the questions will be displayed on the computer and you will choose the correct answer by clicking on the correct options displayed on the computer screen. LIC ADO Exam Syllabus – Two Parts in examination. First Part A will contain questions from numerical ability and test of reasoning. Second Part B contains questions from Reasoning, English, Math, General Knowledge and Current affairs. · Official Website – www.licindia.in.